What follows isn't a life hack, clever trick or road warrior tip. What follows is common sense. It was ugly, and perhaps a candidate for /r/RedneckEngineering, but boy did the technique work. 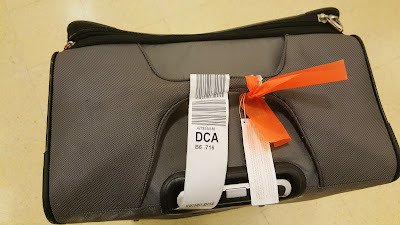 When I our bag was pulled aside and tucked into a corner at baggage claim, I still had no problem identifying it from a distance. And had I needed to ask a baggage handler to look for the bag, it would have been straight forward to send them after the one with bright orange flagging tape on it. Simplicity for the win. Why didn't I do this years ago? In hindsight, I recall that years ago my grandparents (Z"L) had a yellow ribbon tied around their car's radio antenna to help them find it in a parking lot. At the time I thought, oh how cute. Now I realize (a) they were smart, and (b) I'm old.